The project is one of the first by the MetLife Mature Market Institute and the Center for BrainHealth at The University of Texas in Dallas to investigate the connection between cognitive health, aging and decision-making capacity. Project researchers argue that previous large sample studies that document declines in the ability to think logically and solve problems with increasing age fail to control for factors, such as early dementia or other medical causes, which can contribute to declining decision-making capacity. In addition, previous research ignores positive age-related factors such as life experiences, reasoning ability, and accumulated knowledge that may preserve or even enhance decision-making. In this study, investigators focused on the financial decision-making capacity of healthy middle age and older adults. The primary goal was to identify factors that may increase or decrease the risk of poor decisions in healthy people aged 50 to 79. Participants were carefully screened for dementia and other cases of cognitive decline. The study evaluated 72 adults (31 men and 41 women) with ages evenly divided between men and women within each of the three decades (50s, 60s and 70s). Thus, each age group contained approximately 10 men and 13 women. Participants completed a decision-making task designed to test their ability to make logically consistent financial decisions. Each individual’s decision-making was compared with their performance on measures of strategic learning capacity as well as traditional cognitive measures such as IQ and self-reported decision making styles. Strategic learning: the ability to determine and use a strategy to sift more important information from less important information. This strategy helps us manage and synthesize the overwhelming influx of information we are presented with each day. The researchers found no decline on the decision-making task with increased age. All three age groups performed at a comparable level and showed only a small inclination toward riskier choices. Thus, with advancing age, individuals with intact cognition retain their ability to make logically consistent decisions. The study results shed light on factors that do and do not contribute to poor decision-making. Researchers found that strategic learning capacity may actually increase with age. Those participants in their 70s performed at least as well as the 50s age group on a cognitive measure of strategic learning. Moreover, they found that conscientious decision-making intensifies with age; older decision-makers reported themselves as more conscientious (i.e., careful and organized) than those in the younger age group reported themselves. While age alone wasn’t a predictive factor of lower decision-making capacity, impaired strategic learning was strongly related to worse decision-making. Participants that had low strategic learning scores were less conservative and made a fewer number of logically consistent decisions. Together, gender and intelligence influence decision-making consistency. Men who scored in the superior range of cognitive ability such as IQ, working memory (i.e., ability to hold information in mind for later use), verbal fluency (i.e., generating as many items in a particular category as possible in a short time period) and processing speed (i.e., how fast a cognitive task is performed), made more logically consistent decisions than men who scored in the average range. In contrast, there were no significant differences in logical consistency across the cognitive levels in women. The study findings are a crucial first step to move beyond age as a demographic factor used to explain impaired decision-making. Policies and practices that focus exclusively on age-related declines in decision-making will unnecessarily curtail the autonomy of older adults with preserved cognitive function. Age is not a disease, therefore noticeable drops in mental decline warrant medical attention to determine cause and best course of action. Maximizing cognitive potential is possible across the lifespan. Experts believe vigilant decision-making is the best approach for making important decisions. Vigilant decision-making occurs when you take the time to calmly assess the goals of your decision, gather relevant information, review the information, and make a decision based on the information. Decide what is most important to you and make a list of those items or options. For example, if you’re buying a new car, determine the factors that are important to you, such as gas mileage, comfort, price, etc. List the items or options in order of their importance or priority. Investigate each item. For the car-buying example, test-drive several cars that have the factors you most prefer. Make your decision based on the importance you gave to each item or option. Maintaining cognitive brain health, staying engaged in personal decisions, and continuing to build up rich life experiences are all crucial elements to becoming and remaining a strategic decision maker. In addition, consumption of berries may help prevent age-related decline of brain function. 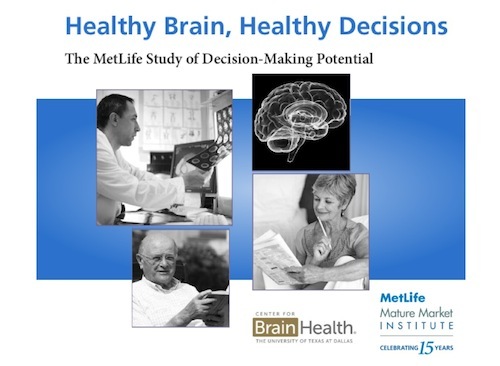 Healthy Brain, Healthy Decisions: The MetLife Study of Decision-Making Potential. MetLife. 2012 Dec.
Study Finds That Age Does Not Impair Decision-Making Capabilities. The University of Texas at Dallas News Center. 2013 Jan 17.